Sustainable Belmont has promoted healthy homes and yards several ways. If you are interested in supporting efforts around Healthy Homes (and Yards!) please contact sustainablebelmont@gmail.com. Members of Sustainable Belmont have organized a tour of organically managed gardens and farms (!) since 2011. The tour features vegetable, herb, fruit and flower gardens that use organic and sustainable growing principles. 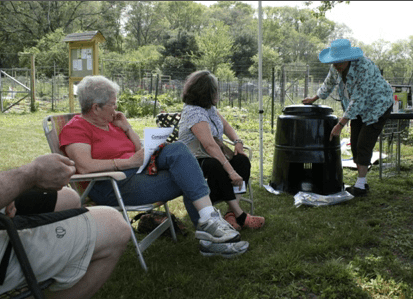 Among other practices, visitor may learn firsthand about composting, rain barrel watering, environmentally friendly pest control and other organic practices. Historically, the tour happens in September and we review interested participants in late July through mid-August. Please let us know if you would like to participate or receive announcements about the event. Present and past organizers and volunteers include: Martha Cohen, Jeri Weiss, Nancy Forbes, Priscilla Cobb, Lucia Gates and others. Sustainable Belmont member, Judy Otto demonstrates composting at Rock Meadows Victory Garden. Belmont residents can purchase compost bins at a discount through the town DPW at the Homer building (next to the Town Hall) on Concord Ave.
A group of parents work collaboratively across schools in cooperation with the Town Recycling Coordinator on issues such as reducing waste, educating on and monitoring recycling, behavior changes to reduce energy consumptions, and fostering walking and biking to schools (Safe Routes to Schools). Current topics include organics diversion in the Wellington and Chenery, and “green” lunchboxes for students. By sharing best practices and addressing issues with municipal employees and elected officials, they endeavor to make our schools healthier along with our local environment. In 2006, Sustainable Belmont offered a free forum on organic yard care – enabling residents to make healthy home choices that keep toxins out of our water system and sustain biodiversity. Members have contributed educational articles to the Belmont Citizen-Herald on topics such as sustainable lawn care, safety with personal care products, and good environmental practices during the holidays.